The Switzerland international has been with the Gunners for the past two-and-a-half seasons and during this period, he has contributed 11 goals and 14 assists in 121 appearances for the club. 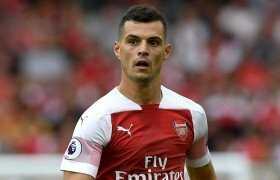 According to Calciomercato, the Nerazzurri are said to have an eye on the performances of Xhaka and they are prepared to make a formal approach for his signature when the transfer window reopens. However, the San Siro giants are aware that it won't be easy to convince the Gunners into a sale, given the club are due to lose Aaron Ramsey on a free transfer in the summer. Xhaka has had his fair share of criticism from the Arsenal supporters in the past three years, but he has improved his showing under the guidance of manager Unai Emery this term. He has missed the past three games for the Gunners with a groin complaint but is likely to return to the mix for the forthcoming league clash against Watford on the road.